So, you have a cut up fryer (which you don't intend to fry), a family pack of split breasts or some boneless chicken thighs. Now what do you do? Why, use the best herbs for chicken to make a memorable meal, that's what! If you have chicken in your fridge or freezer, you're in good company. In 2013, chicken officially became America's favorite meat, surpassing beef for the first time. The average American consumed nearly 60 pounds of chicken in 2012, and that number is likely to grow as the cost of beef keeps spiraling into the stratosphere. Sometimes mild ingredients like chicken need a little help to shine, and because many of us eat a lot of this friendly fowl, it can present a challenge coming up with new ways to prepare chicken so it doesn't feel like déjà vu all over again. That's where herbs and spices come in. They provide the surprise in the mix -- an explosion, fusion or flood of flavor that enhances other ingredients. Add a strategically placed sage leaf and you have chicken saltimbocca, marry pounded breasts with wine, thyme and mushrooms and you have chicken Marsala. Sure, other ingredients, notably acidic ingredients that can travel deep into meat fibers taking a freight of herby, nutty, smoky, salty or sweet flavor with them, do help. But never forget that the simple addition of herbs provides the easiest, fastest and often most effective way to enhance chicken and create a pretty decent main course for the effort. Content about herbs can seem little backward to me, like a cook is going to head to the spice cabinet, pick a spice and then figure out what types of dishes he or she can make with it. The situation I usually find myself in is a little different: I open the fridge, remember I've defrosted chicken breasts and then try to discover some new way to prepare them that won't feel like just another Wednesday night dinner at my house. Armed with lots of herbs, it's an exploratory mission -- and usually pretty fun, too. Let's take a look at some of the herbs that know and love chicken. You'll recognize many of them because they're likely staples in your spice cabinet right now. This year, try planting a few in your garden, too. Fresh is best -- but you probably already know that. Chives - With a mild onion flavor and delicate leaves, chives work well in almost any savory dish. Sometimes paired with chicken, a top dressing of sprinkled chives makes even fried chicken taste fresher and -- um, onionier. For the best results, add chives just before serving. Cilantro - Love it or hate it, cilantro is here to stay. A Tex-Mex staple, the flavor of cilantro wakes up recipes by helping to make the ingredients taste brighter, fresher and more complex than the addition of this frilly leafed green would appear to warrant. Like many, I enjoy using cilantro -- sparingly. A little of this herb goes a long way. If you're not sure how you, a family member or guest will respond to cilantro in a casserole, salad, salsa or other dish, cut the amount stated in the recipe in half. You can always add more. Cilantro seed is known as coriander, which can be confusing. They are rarely used interchangeably. Cilantro is typically called out in Mexican, Tex-Mex and some Asian recipes, and fresh cilantro is overwhelmingly preferred over dried options. Once dried, cilantro loses most of its flavor and nearly all of its distinctive aroma. If you're a fan, the idea of substituting something else for cilantro may seem like sacrilege, but cilantro detractors will typically substitute flat leaf parsley for a hint of green without the sour foretaste. Garlic - What can we say; garlic isn't called the king of herbs for nothing. When paired with chicken, it brings out the natural sweetness of the meat. It also manages to turn what could be a one note bird base into a richer, more robust dining experience. Garlic can be used alone in hot and cold chicken dishes, or can be paired with favorites like thyme, sage, rosemary or tarragon. Marjoram - A mild cousin to the more popular oregano, marjoram is a savory herb that's well-mannered enough to work well with chicken, and can be paired with other chicken friendly herbs like thyme or rosemary. Paprika - This red pepper with (often) European attitude has more going for it than you may realize. It's probably your default garnish for deviled eggs, but paprika releases much of its rich flavor when it's heated, not sprinkled on cold. That's one reason your fried chicken flour mixtures, chicken barbecue sauces and marinades should contain this complex but not overpowering herb (spice, whatever). If you've ever wished for a hearty, peppery presence, but without the breathtaking heat, give paprika (Hungarian, smoked or Spanish) a try. Parsley - Parsley is a mild herb often used as a garnish. It's known as a makeshift breath freshener (just chew a few leaves), and as a colorful accompaniment to potatoes and stuffing. Parsley isn't the most exciting of herbs, but it has an interesting ability to bring out the flavors of other ingredients without making a strong statement on its own. I like to add it to the last few minutes of cooking time for stews, soups and sauces that feature chicken, pork or beef. It looks good, smells good and doesn't interfere with the stronger aromas and flavors of herbs like tarragon, sage and rosemary. When added to soups that are heavy on legumes or grains, it has a garden fresh appeal, too. If I'm experimenting with a recipe for the second time (the first time I follow the directions), I always keep fresh or dried parsley out on the countertop just in case my efforts appear too bland. Flat leaf varieties are preferred. Oh, and parsley has a useful freight of vitamins, minerals and other goodies to offer. They include: calcium, copper, fiber, folate, iron, magnesium, manganese, niacin, phosphorus, potassium, protein, riboflavin, thiamin, vitamins (A, B6, C, E, K) and zinc. Making parsley a go-to herbs wouldn't hurt. Rosemary - You love it on roasted fingerling potatoes, but the resinous aroma of rosemary mixes remarkably well with chicken. 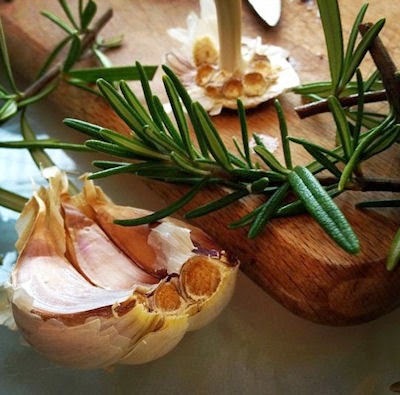 Especially tasty with skin on chicken recipes, rosemary helps cut the fat and gives chicken (and often gamier dark meat pieces like thighs and legs) an unexpected richness not often found with fowl. Use it under the skin when roasting whole chickens, and try using rosemary stem skewers when grilling chicken or turkey kabobs. 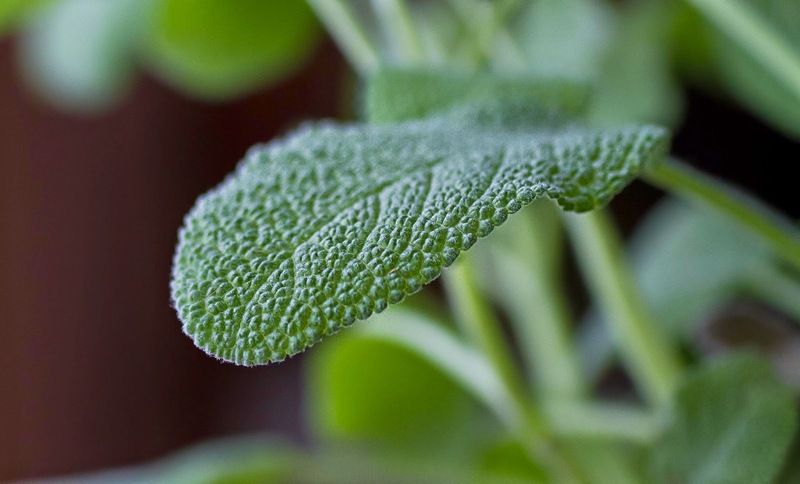 Sage - The go-to herb for sausage and stuffing recipes, sage and chicken are blissful plate mates. 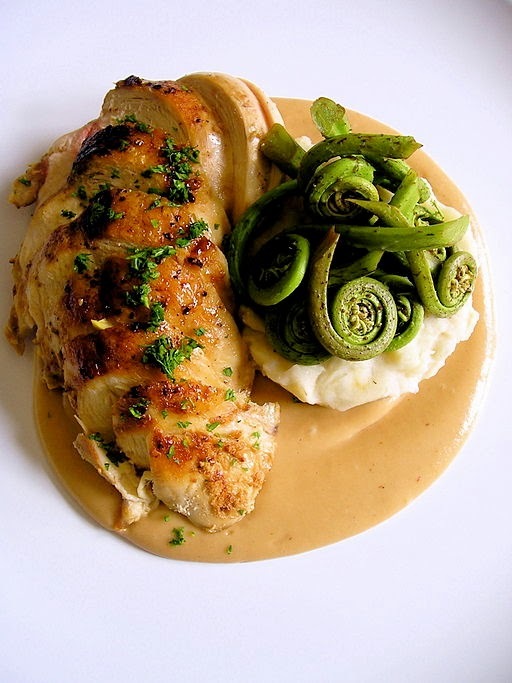 The woody taste and somewhat bitter aroma of sage marries well with the neutral flavor of chicken, so much so that most chicken seasoning blends include at least a little ground sage. Chicken saltimbocca is a classic chicken and sage recipe that uses the whole sage leaf for a pop of flavor. It’s a dramatic example of why these two ingredients work well together to produce dishes that are: mild, woody, subtly rich, tender and juicy. You'll find sage in powdered, rubbed and fresh forms. With this herb, it's often best to use whichever version a recipe recommends. Tarragon, French- (Artemisia Dracunculus) - I came to tarragon late in my herb sampling career. I've never been a lover of ingredients that taste like licorice, especially when they're used in savory dishes. Tarragon is different though: the licorice is a whisper, and blends with earthy notes that are mildly like thyme. Where I thought tarragon would overpower chicken, it actually enhances chicken's creamy texture. I'm a big fan these days, especially for using tarragon in cold chicken dishes and those paired with mustard, mayonnaise or wine. Here's an easy one. 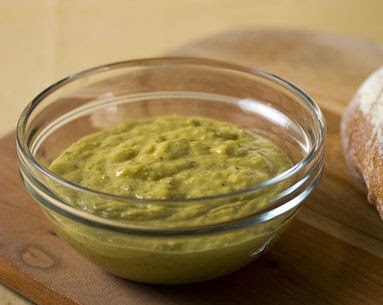 Use this tarragon mustard spread with leftover chicken. Just cube cold, cooked chicken (grilled, boiled or fried) and toss it with the mixture. Add it to your favorite veggies and serve in a pita or pile it onto a green salad. Combine all ingredients, stir and chill. *Note: You can substitute dried tarragon, but use a third of the quantity, and let the flavors develop in the fridge for a couple of hours or overnight before using. You can also make your own mayo from scratch. I like doing that around the holidays, but usually use prepared mayonnaise and the easy recipe above. Thyme - Pungent and slightly minty, thyme is often used to flavor fish, eggs, pork, poultry and vegetable garden staples like tomatoes and squash. Because it's so versatile, it's easy to forget how important thyme can be for bringing out the earthy qualities of the ingredients it's paired with. A bit of chameleon, it can be hard to pick out the flavor of thyme in a recipe, but you'll notice when it's not there. 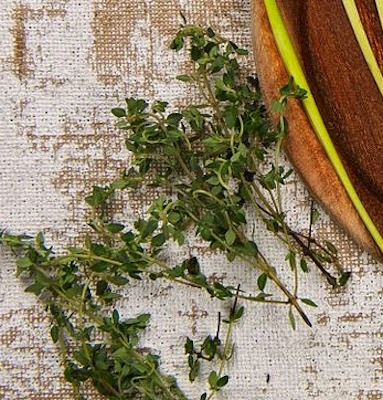 Consider using thyme in any chicken dishes that call for wine or include mushrooms. Although we've hit the highlights, many herbs work with chicken, especially when combined with ingredients like hot peppers, citrus, fish sauce, or hot, sweet ginger. Here are a few others you may want to explore: lavender, dill, savory, bay leaf, saffron, turmeric and cumin. Really good ideas here looking forward to trying them. And it's so much fun making your own herb mixes too!